Approximately 20 years after the introduction of the first CCP remote monitoring systems for which technical requirements and mode of operation are described in DVGW Code of Practice GW 16  and which meanwhile represents an important and indispensable technical standard in the field of CCP, we are currently experiencing the introduction of a completely new technical standard for CCP remote monitoring, which is fundamentally different from the existing remote monitoring technology and opens up completely new possibilities. 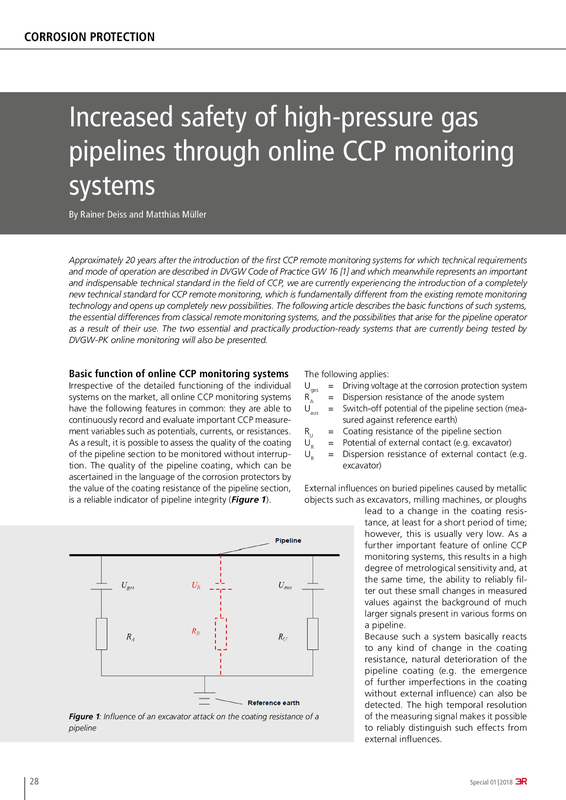 The following article describes the basic functions of such systems, the essential differences from classical remote monitoring systems, and the possibilities that arise for the pipeline operator as a result of their use. The two essential and practically production-ready systems that are currently being tested by DVGW-PK online monitoring will also be presented.